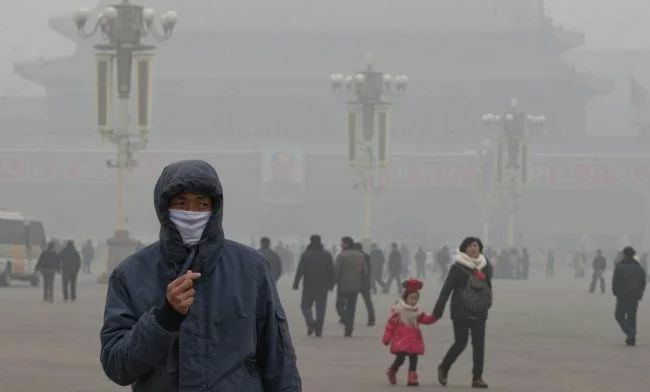 The problem of air pollution from smog is especially important in China, since during the period of rapid industrial growth, few people thought about the safety of the environment. However, in recent years the situation has become almost critical, which even affected people’s health. Therefore, today the Chinese do not spare forces and resources to correct the situation. For example, just a few days ago in the city of Xi’an (Shaanxi Province), the world’s largest smog cleaning plant was launched. Moreover, this installation operates on solar energy, but not in the usual sense. The main innovation of the Chinese installation is that it works in a passive mode. On the ground there are many glass roofs for catching sunlight. The air, heated, flows through the tube system upward into a main pipe 18 meters high. In the pipe, the polluted air passes through a series of filters, and it enters the atmosphere already purified. Every day the installation passes through itself from 5 to 8 million cubic meters of air. The data taken from the pollution sensors indicate a decrease in the concentration of solid particles in the air by 19%. It is also worth noting that the cost of construction was $ 2 million, and the total area of ​​all wastewater treatment plants is 10 square kilometers. But, despite successes, ecologists have a lot of claims to work, no doubt, the necessary purification plant. Firstly, there is no data on whether the antismogging plant cleans sulfur dioxide, one of the most dangerous substances that pollute the air. In addition, experts say that one treatment plant is a drop in the ocean. For normal air purification, at least a few dozen such structures are required, and given the considerable area of ​​the complex, it will be very problematic to do this.